We couldn’t be more proud of Michaele Dimock, ROTH Trainer Student! This article in The Cody Enterprise By BUZZY HASSRICK featured our very own Michaele Dimock! Michaele is part of the up and coming Train the Trainer class, and her passion for the mustangs is really shining thru! We look forward to seeing what this advocate will do next. Michaele Dimock describes herself as an “equine eccentric,” or horse lover, as evidenced partly by the number of wild horses she’s adopted. Her dozen or so mustangs join Belgians, Fjords, Icelandics and quarter horses lucky enough to live on her lower South Fork ranch. She drives the Belgians as teams pulling antique wagons and rides the other horses in dressage or on mountain trails. “As a 5-year-old, I loved horses,” Dimock said. “I took lessons every chance I got.” As a child she also helped with pony rides. As an adult, Dimock is studying to become an instructor certified by Anna Twinney of Golden, Colo., an internationally renowned equine specialist. Twinney will visit Dimock’s ranch for the sixth time this summer and conduct two clinics, one on “untouched-horses” for a week and the other on holistic horsemanship for two weeks (see reachouttohorses.com). For the first untouched-horse clinic in 2010, Dimock acquired 10 mustangs to provide one horse per student. The first two mustangs she obtained through an online adoption, where “it’s not hard to win a bid,” she noted. She drove to Rock Springs in February to pick up the two McCullough Peaks mares – Corona, a buckskin, and Topa, a black-and-white paint. They foaled, respectively, Tango and India. She also selected two others, St. Patty, a bay, and Niagara, a gray. The latter was admired and later adopted by a Casper friend of Dimock. That April at an auction in Powell, she chose Caliente, Topa’s daughter from the year before and India’s full sister. She also adopted Kismet and then bid on a horse among the group left unclaimed at auction’s end, offering $25 for Kitkat, a black mare. “She looks just like her sire,” said Dimock, who has studied the extensive records kept by BLM. A BLM official asked Dimock to adopt a horse named Raven, whose owner no longer wanted him. She renamed him Radar. 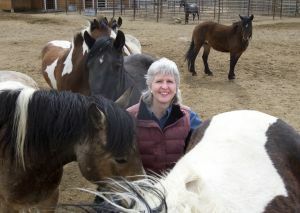 Dimock is committed to placing the mustangs she fosters for the Twinney clinics. “It’s my personal passion to help them learn skills in basic handling and then find them homes so they don’t have to be returned to the Rock Springs holding facility,” she said. Of the 10 mustangs fostered in 2010, Dimock placed seven through word of mouth and Facebook postings, and with clinic participants who had become enamored with their equine students. She adopted the remainder. The mustangs are good on the range, mountain-savvy and level-headed, in her opinion. “You can develop a special bond when you take the time to work with a mustang,” Dimock added. She spends time with her mustangs between clinics, documenting their progress with each milestone they reach. Teaching a wild horse to accept human touch can take 1-3 days, but “once you get to that point, it just takes off,” she said. Early lessons include grooming, haltering, hoof-handling and leading. Next come bathing, “spook-busting” through exposure to blankets and flags, and an obstacle course through which they’re led or herded. Finally they’re led by a rider. The public is invited to watch the clinics Aug. 12-31 for the price of a donation to Friends of a Legacy, the nonprofit advocacy group for the McCullough Peaks mustangs. Next postARE YOU THE LEADER YOU WOULD FOLLOW?